RBTH presents a selection of views from leading Russian media on international events, featuring a report on the latest developments in EU strategy toward Ukraine, analysis of the negotiations in Moscow between Russian Foreign Minister Sergei Lavrov and his German counterpart Frank-Walter Steinmeier, as well as a report on how the attack on a synagogue in Jerusalem may affect Israeli-Palestinian relations in the near future. The Nezavisimaya Gazeta newspaper reports that in the upcoming days the ongoing conflict in the Donbass region of eastern Ukraine may be frozen. If the military situation, as Kiev believes, is now determined by Russia's influence on the region’s pro-autonomy militants, then the future of the Donbass depends on the West's control over the Ukrainian government's actions, writes the newspaper. 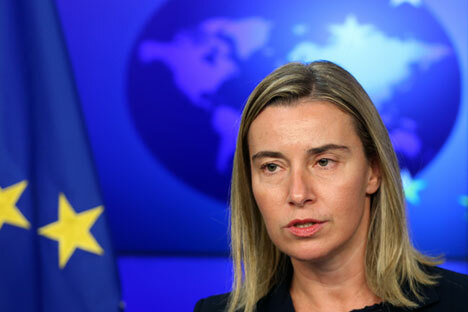 High Representative of the European Union for Foreign Affairs and Security Policy Federica Mogherini announced that the EU has developed three strategies towards the stabilization of the situation: reducing the tension in eastern Ukraine by means of dialogue with Russia, the continuation of pressure via sanctions and internal reforms in Ukraine. Director of the International Democracy Institute Sergei Taran explained to Nezavisimaya Gazeta that reforms are the only way to stabilize the situation in Ukraine. However, in Taran's opinion, if the Ukrainian government has still not manifested a desire to implement the reforms, it will now have to do so under pressure from the West. The newspaper also writes about German Foreign Minister Frank-Walter Steinmeier's visit to Kiev, reporting that the Ukrainian side hopes that the German foreign minister's mediation to stabilize the situation will bear fruit. Nezavisimaya Gazeta remarks that the Council of the EU, on the foreign ministry level, has virtually gone along with Russia's requests and recommended the parties "intensify negotiations within the framework of the trilateral Ukraine-Russia-OSCE contact group." Presumably, the participation of representatives from the self-proclaimed Lugansk and Donetsk people’s republics was also expected, but not on equal terms with the other participants, concludes the newspaper. The Kommersant newspaper reports that after his visit to Kiev, Germany Foreign Minister Frank-Walter Steinmeier traveled to Moscow to meet with his Russian counterpart Sergei Lavrov. Although the ministers evaluated the crisis and the current position in the Donbass differently, they were nevertheless unanimous in their opinion that it was necessary to implement the Minsk Agreements, reminding everyone that the peace agreements are the only document signed by both sides of the conflict that can regulate the crisis. "Even if there are grounds to say that the most important obligations have not been met, nevertheless it would be a great loss to reject these documents," Kommersant quotes the German Foreign Minister as saying. Both ministers admitted that the agreements are not ideal, but warned that there is no reasonable alternative, underlines the newspaper. According to Kommersant, Lavrov and Steinmeier were also agreed on the steps that need to be taken to revive the Minsk process: Determine the precise demarcation of territories under the control of Kiev and the militias, pull back the troops and begin removing heavy weaponry, create a demilitarized zone and create the conditions for OSCE monitoring. Lavrov invited everyone to concentrate on stimulating the sides to implement these points "instead of making nervous statements, behind which lies the desire to destroy the attempts to realize the Minsk Agreements," adds Kommersant. Steinmeier admitted that, "there aren't many reasons to be optimistic," adding that the collapse of the Minsk Agreements is also preoccupying his EU colleagues, whom he had met in Brussels on the eve of his trip. In another article, Kommersant writes that the Middle East is threatened with a new escalation of Israeli-Palestinian hostilities. This became obvious after Palestinian radicals attacked a synagogue in Jerusalem, killing four rabbis and a police officer. The newspaper writes that the radical Popular Front for the Liberation of Palestine has taken responsibility for the attack. President of the Palestinian National Authority Mahmoud Abbas and his Fatah party condemned the terrorist act, however, Hamas, which controls the Gaza Strip, welcomed the attack, calling on all Palestinians to carry out "new acts of retaliation." Israeli Prime Minister Benjamin Netanyahu has blamed not only Hamas for the tragedy, but also Abbas, who, along with the radicals, is allegedly carrying out acts of incitement with the connivance of the international community. Kommersant remarks that the terrorist act at the synagogue may lead to the end of the current Palestinian-Israeli dialogue and the renewal of violence.